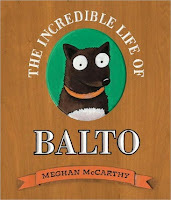 You only need to take one look at the cover of The Incredible Life of Balto, and you know it's the latest creation by the talented Meghan McCarthy. There is Balto staring right at you with the signature large white eyeballs that McCarthy used to illustrate characters in Aliens Are Coming, Pop! The Invention of Bubble Gum, and Strong Man: The Story of Charles Atlas. This time McCarthy tells a story that is beloved by children across the country; the story of how one spunky dog (and his teammates) helped save a village in Alaska. Many of the patrons in my library are familiar with the the story of the dog hero, Balto, mainly because of the animated movie. Those same children, who love dog stories and adventures, will be quick to pick up McCarthy's nonfiction picture book account of how sled dog teams brought serum to Nome, Alaska during a diphtheria outbreak in 1925. Twenty teams of dogs took part in the relay to bring the medicine from Anchorage to Nome in temperatures fifty below zero. McCarthy describes the events in a clear and accessible narrative style. "A man named Gunnar Kaasen was chosen as the musher to run one of the last legs of the race...and he picked a dog named Balto to be his leader. This was a surprising choice! Balto was inexperienced and not as fast as some of the other dogs. Nobody had ever thought he was special- until now!" The story does not end once the serum is delivered to Nome. McCarthy goes beyond the happy ending to detail the rise and fall of Balto's fame. Balto starred in a movie, and a statue of him was placed in Central Park, which added to his celebrity after his adventures in Alaska. Sadly, an argument over money forced Balto to be sold to a vaudeville show then to sideshow where he and his teammate, Togo, were mistreated by owners. The book does not end on a sad note; a businessman heard about Balto's mistreatment and rallied school children to collect pennies save Balto. The cartoon style illustrations will appeal to young readers. The changing tone of the story is reflected in the acrylic paint. A bright blue sky is contrasted against the white snow in an illustration of Balto and Gunnar standing beside the statue of Balto in Central Park. Several pages later, McCarthy uses brown and gray to illustrate Balto and Togo chained next to an empty food dish. The last page shows Balto leading a team of dogs as they pull a group of school children in cart with beautiful trees and green grass all around. 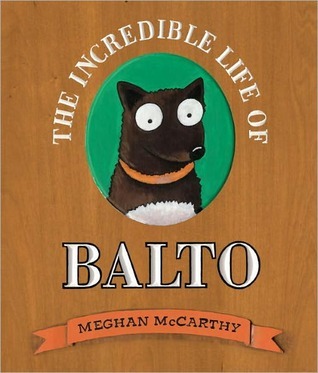 McCarthy includes a detailed note about how she researched the story of Balto. Teachers should be sure to share McCarthy's notes with their students; there are lots of great lessons packed into this one page. A list of activities for kids to try and a selected bibliography are also included in the back. The Incredible Life of Balto would make a strong addition to K-5 library collections. It would make an ideal read aloud to one child or for an entire class, and you can be sure that it will circulate with children who love animal stories. Years ago I was fortunate to have found an old book written by Balto's owner, Leonard Seppala. He and his lead dog, Togo, actually traveled many more miles on the serum run and should have been the real heroes, but the media latched on to the Balto story and would not let go. Years later Seppala corrected the error. It's a fascinating read, but I can't remember the title. Balto was loaned to Gunnar Kaasen, and Seppala favored Togo as the superior dog. Togo was retired after the serum run, having spent his heart in the effort.